Do you Share your Book Memories with your Children? My eldest has read The Magaic Faraway Tree books and devoured them. We have just finished reading them to his little sister. She was as enchanted as the wood! These were both mine and my husband most favourite childhood books. Oh the pleasure in rereading and sharing the joys of Moonface and dear old Saucepan Man. We had very little money and not many books or toys when we were young but my mum took us to the library all the time and we played outside and used our imagination for hours …we were rich indeed! The books we did have included mums own Famous Five books, a collection of Flower Fairies, Malory Towers and St Clare’s books that had also been mums and a few ladybird books. I also owned a big Hans Christian Anderson fairy tales book and a book of baby animals . I say owned but all these were shared. 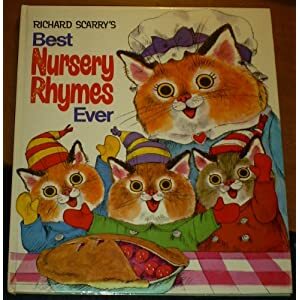 I also recall a rather fabulous nursery rhyme book by Richard Scarry. The book was full of gorgeous detailed illustrations. I must have read it hundreds of times when I was little. It is my most remembered object from our playroom. Well I decided we had to have it. I found it at 1p plus £2.80 postage in Very Good Condition from Amazon or £10 used from eBay. Always check both! Now 5, my daughter should be able to read these rhymes to herself. I think she will adore their nonsense. How I wish I had bought this earlier. So glad a copy is now on it’s way back to our family. As a book reviewer at book reviews for mums and a charity shop and car boot lover I buy and receive MANY books and my children have large libraries of their own. Lucky things. But we had a few that we read and read and read my sister and I. And we loved them and knew them so well. How precious to share them with our own kids and hear them giggle over the very same things. I am really enjoying that my daughter has reached the age when I can read her my favourite stories from when I was a child. 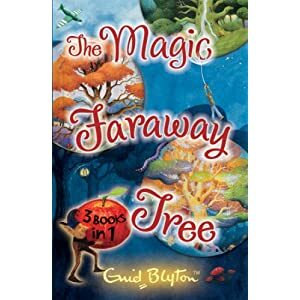 I also loved the Faraway Tree and we’ve read all three books together which she has loved. We’ve just started on The Wishing Chair which is a very similar series. It will be lovely when she can read these for herself as well, but I’ll miss having the excuse to read them with her! I actually can’t wait to get to the point BabBee can listen to and then read all the books I have loved over the years. Most of them are still at my parents house in a super tatty state waiting for me to collect them and re read them! my only query is, what do little boy babies read these days, we were all girl babies! We too are reading the wishing chair (names are a bit dicey aren’t they!) I so wish I had a wishing chair! I have such fond memories of the Magic Faraway books and the Wishing Chair. We’re currently reading Grimm’s fairy stories and Ruby is totally engrossed. some of the books seem so dated when you read them back, but they are brilliant. We are onto third generation with some of our books as well. I like the fact they are as written by the authors and not changed and adapted to give them happy endings as modern books are.